What’s flat and round and can be rolled around just about anything? Tortillas, of course, and even though we have a fantastic tortilla bakery right next to our house, we thought we’d try our hand at making them at home. 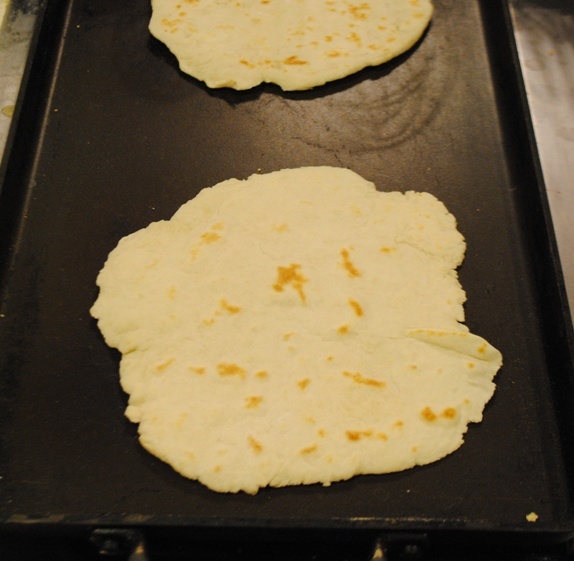 We started with La Pina enriched flour for making tortillas and followed the recipe right on the bag. 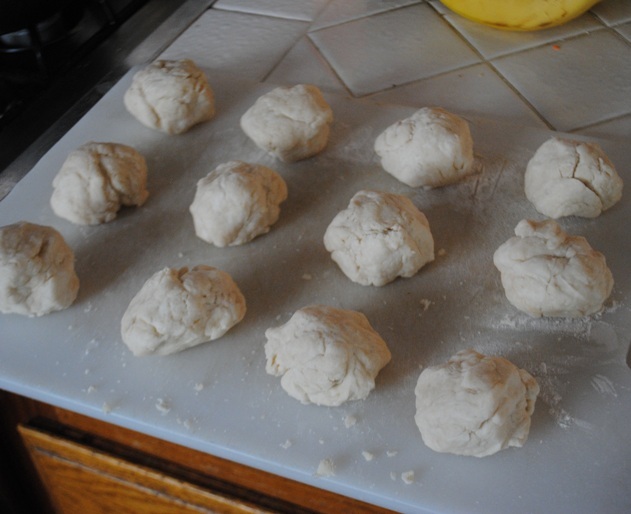 The recipe called for lard or shortening; we used shortening because that’s what we had on hand. (Would it have improved the texture if we had used lard? Probably.) 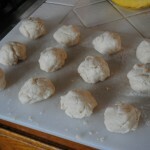 Making the dough was easy enough, and then shaping them into cute little balls was great fun for everyone. Then came the tricky part, which was getting them flat enough. We used a tortilla press for the first few, and they came out a depressing 1/4 inch thick – way too thick to roll up. 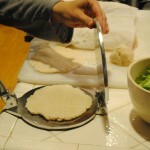 After that we resorted to using a rolling pin, but even so, the dough was hard to get completely flat. Eventually we got them flat – or at least flat enough – so we prepared them two at a time to fit in pairs on the griddle. They still weren’t exactly tortilla-thin, but they browned up nicely and smelled great. And the verdict? Hmmm. They weren’t quite as floppy as we had hoped, and they weren’t quite flexible enough to roll around something. Truthfully, they came out more like flattened biscuits. But here’s the funny part: that didn’t stop the kids from eating them. Which is amazing, because imagine messing up a Brussels sprouts recipe. It’s a little hard to picture the kids gobbling it up, right? But give them a white bread product in any form and they are all over it, no questions asked. We didn’t even expect anyone to eat the leftover tortillas, but sure enough, they devoured them on Day 2 as well. Fair enough, but next time, we’re probably just going to go to the bakery.